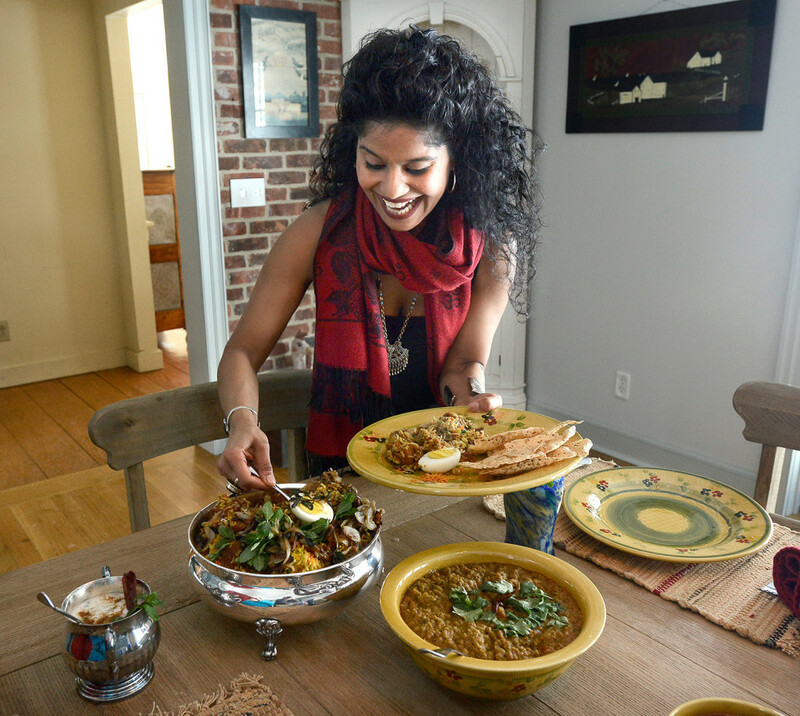 The layered flavors of Cherie Scott's Indian dish remind her of the love her mother showed for her family in the kitchen. BOOTHBAY — When the smell of saffron steeping in warm milk fills her house, memories of childhood flood Cherie Scott’s senses. This recipe for lamb biryani is complicated, and lamb is expensive, so her mother made the dish only on special occasions at their home in Mumbai. That included Scott’s birthday, when Scott would stand by the stove while her mother pan-seared potatoes in ghee and gobble them up as fast as they were cooked. A biryani is a rice dish made with meat marinated in yogurt and spices. In this version, tomatoes, onions and potatoes cooked in ghee help flavor the fragrant lamb. That saffron milk, as well as spices, cilantro and cashews toasted in ghee provide color and crunch in the basmati rice. As with most Indian cuisine, the flavors are painstakingly layered during a long cooking process and best experienced after they’ve had time to blend. So save this dish for sometime when you’re in no hurry – a snowy weekend? – and are in the mood for warm, inviting comfort food. Scott says any meat can be used with this recipe, but if you use lamb, have your butcher cut a leg of lamb into two-inch pieces. 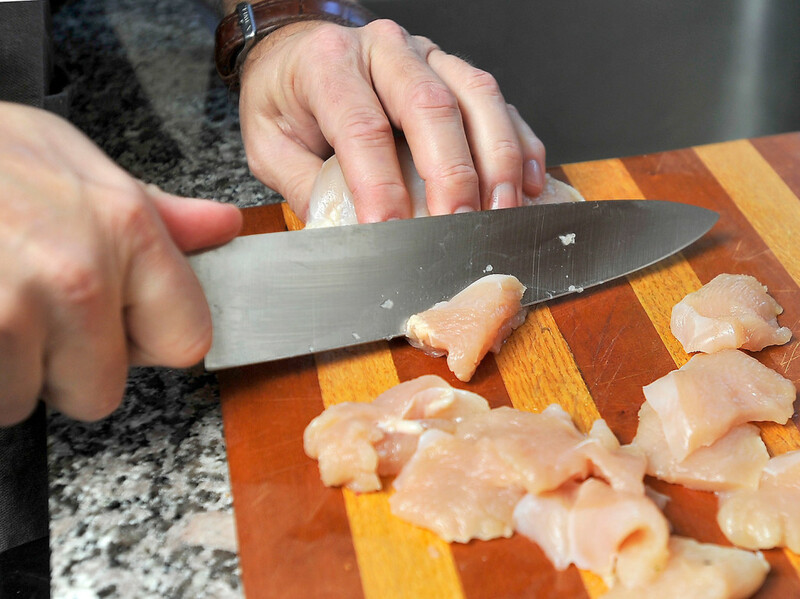 Keep the bone to add to the dish later. There’s one ingredient that should not be skimped on or substituted, Scott says, and that’s the basmati rice, which is grown in the foothills of the Himalayas and tastes nuttier than other varieties. The lamb marinates, preferably overnight, in yogurt, which helps breaks down the meat and picks up the flavor of the spices – turmeric, cumin, coriander and chili powder. 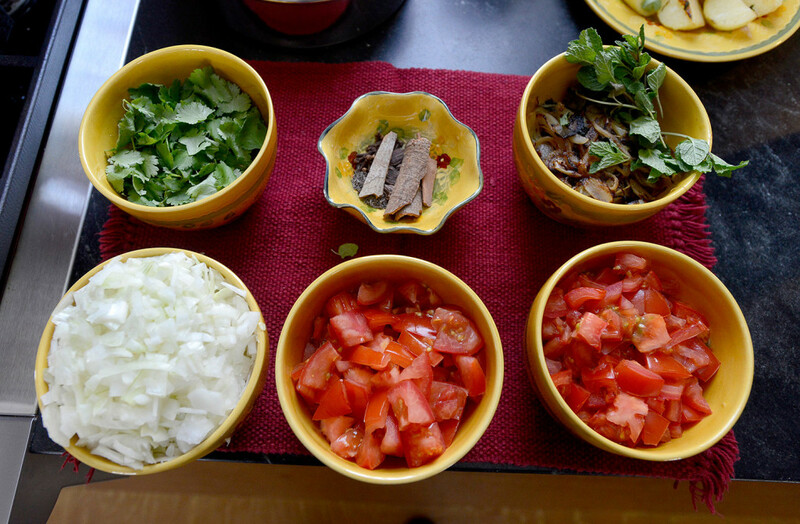 After the onions, tomatoes and potatoes are fried in ghee, the lamb is added with lots of cilantro. 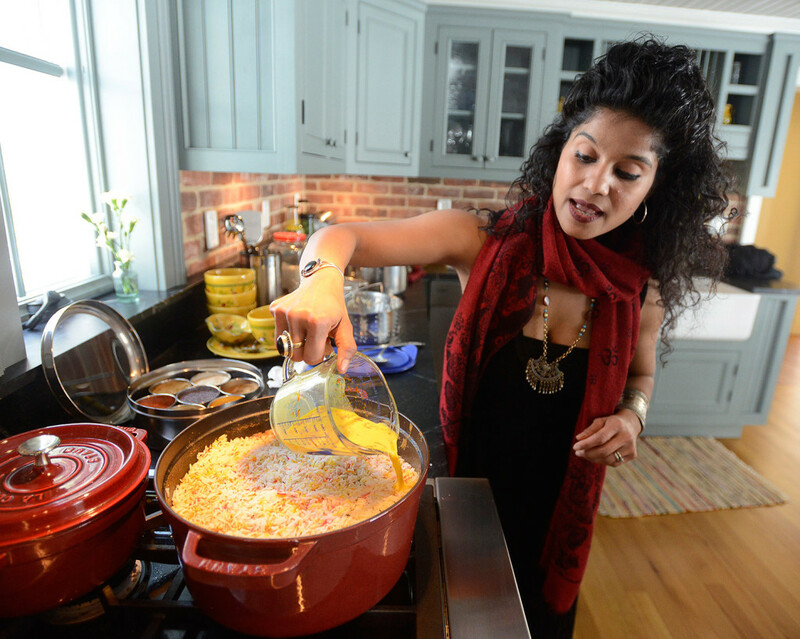 The origins of biryani, a dish that dates back at least several hundred years, are unclear. Some say the word is derived from the Farsi word “birian,” so it must have Persian roots. 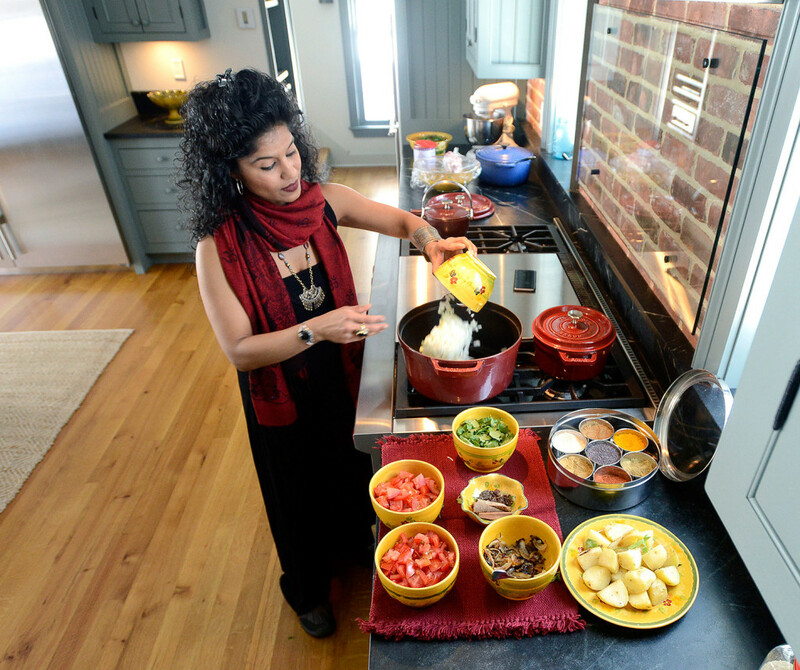 One legend has it that Mumtaz Mahal, the woman entombed in the Taj Mahal, saw a group of starving soldiers and ordered her cook to create something that would be a complete meal for them. 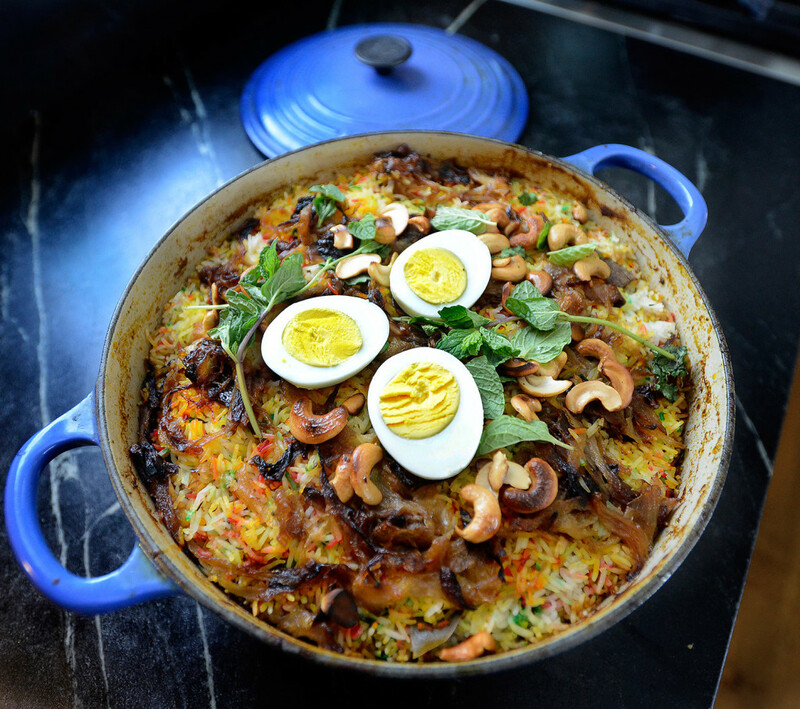 While the Mughals made the dish famous through their feasts, there are many different ways of making biryani, including covering it in dough and burying in the ground to cook, Scott said. “Within one nation, you’ll probably get 40 versions of biryani, depending on whether you’re in the north or south of India, west or east coast of India,” she said. Cherie Scott’s parents are from Goa, a former Portuguese province on the western Arabian seacoast, but they raised their family in Mumbai. They had good jobs, but they wanted more for their children. So, 20 years ago, they immigrated to Vancouver, Canada. Her dream was to be in musical theater, and by the time she turned 17 she had won the Michael J. Fox Performing Arts Scholarship at her high school, the same one the actor attended. After her prom, she hopped a plane to New York City and never looked back. She worked three jobs while studying musical theater at the American Musical and Dramatic Academy. “I ate one meal a day and never told my parents,” she said. She got work performing but after Sept. 11, 2001, decided to move to New Jersey to study journalism and “get that education that my parents had sacrificed so much to give me.” She graduated from Rutgers University and landed internships at MSNBC and Dow Jones. She met her husband, Guy, and had a daughter, Sophia, now 7. The couple moved to Maine to give Sophia “a gentler life.” Scott now works for the Boothbay Harbor Region Chamber of Commerce. Her parents are still in Vancouver. Now in her 30s, Scott wants her daughter to know her Indian heritage. 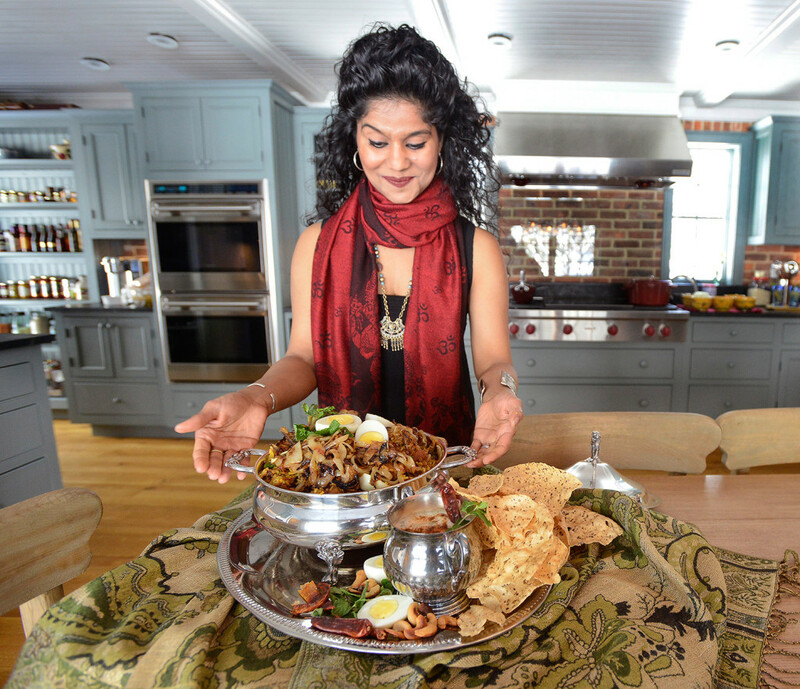 She does a lot of that sharing through food, cooking Indian food several times a month for friends and family and sometimes bringing a dish to school or community events. The final step of her biryani is the rice. It’s flavored with warm and hot spices, cooked part way, then strained. The rice goes on top of the lamb, then Scott pours the saffron milk over the rice gently, in circles – no stirring. Finally, the pot goes into the oven. Scott suggests making the entire biryani the day before you’re going to serve it. When your guests arrive, put it in the oven at 200 degrees and let it warm up while you serve cocktails. Serve the biryani with other Indian dishes, as Scott did last week. In addition to the lamb biryani, the table was laden with red lentil dahl, spicy Goa chorizo, pappadums, raita (a yogurt-based condiment) and mango lassis to counteract the hotter spices. For dessert? A Goa semolina coconut cake served with a mug of hot chai. This particular biryani, she told her husband, will stay with her for a while. She felt like she finally got it right. Do not use sweet onions here.